A musical about Freddie Mercury is in the making – and our singer is there! The idea inspired by Freddie Mercury's life and music was born in the J.K.Tyl Theater in Pilsen. YES! A dance musical that features the life and career of this rock legend is about to appear in the Czech Republic. A top class and well-known trio Libor Vaculík – Petr Malásek – Václav Kopta is involved in its creation. The lead role will be played by our singer Michael Kluch, whose dance counterpart will be the soloist of Pilsner ballet Richard Ševčík. Fourteen years after the premiere of his most successful opus – Edith, the Sparrow from the Suburbs – which is still on the Pilsen Theater's reper­toire, Libor Vaculík has worked applying the same principles and cooperating with a a well-known authoring team on the story of this legend from the 1980s, the leading character of one of the most famous rock formations, Queen. Retrospectively composed musical-dance drama at the beginning brings Freddie Mercury's at the very end of his days on the stage so that the whole story of the ending life, with all its ups and downs, unfolds before his already inward-oriented vision. 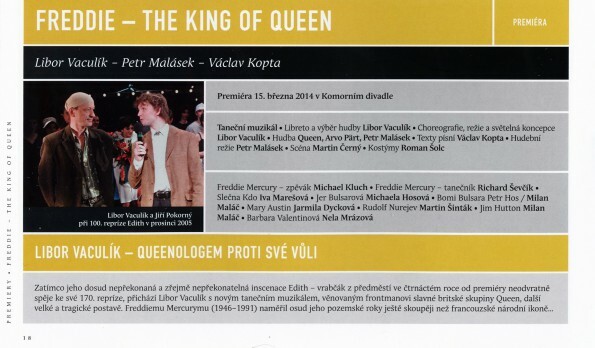 The musical basis for the librettist, choreographer and director Libor Vaculík was a collage of the works of Queen, Arvo Pärt and Petr Malásek. The author of the song lyrics is Václav Kopta, the scene was created by Martin Černý, the costume design is taken care of by Roman Šolc.